We are excited to announce the launch of a new website for GSI Exchange. GSI is a BBB A+ rated leading national coin and precious metals company specializing in: wholesale trading; the establishment of a gold IRA or Silver IRA for individual investors; and direct sales to the general public. The site was well designed but they wanted a new modern site to help them capture the interest of their desired audience. We started by tweaking the design to use white and blue throughout the site, complementing their gold and silver products. We also cleaned up the site’s mobile responsiveness, so now regardless of a users device they can easily navigate the site. Because they are a precious metals site they had some challenges atypical of a normal eCommerce shop. As precious metal prices are constantly changing we integrated the site with a precious metals catalog. This means that customers on the site always see the latest price they will pay on checkout, rather than a quoted price range. GSI does not just sell via the internet, they have a host of agents that help their customers with exchanges, IRA information, and general precious metals advice over the phone. Prior to the their new website this could be a clunky process where the agent had to keep notes then enter them into the system later. We setup the website with a dedicated “Trade Desk” page that allows their agents to place orders for the customers without ever hanging up the phone. Specialized landing pages and marketing funnels to help push specific products and newsletters. A good website is about more than selling, it should also help inform your readers and GSI’s wealth of investing knowledge is perfect for that. We modernized their blog to help them share this knowledge with their clients and the world. 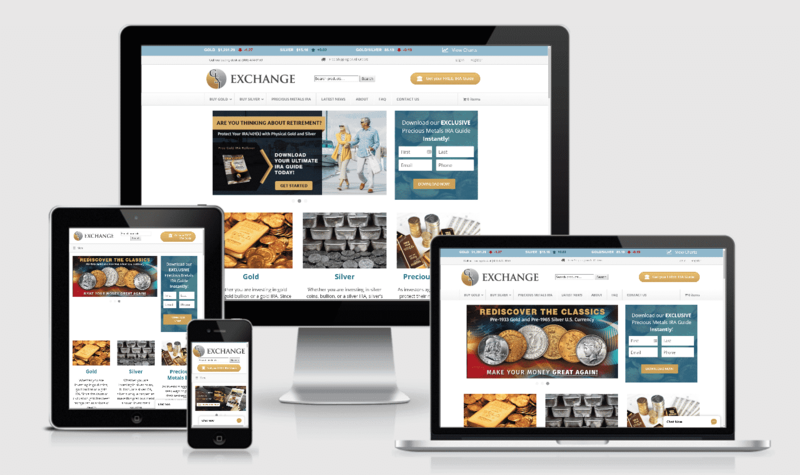 GSI Exchange is a true expert in precious metals and we are thrilled they chose us to help them leverage the power of their website. They are constantly revising their marketing strategies to truly make their website work for them. Whether you’re looking to buy precious metals or just dive in and start researching GSIExchange.com is the place for you.